OK, next to last set of marker shots from Lee County, Alabama. This particular project wraps next week, but first there are two markers and a locally-quarried stone marker within a block of each other. 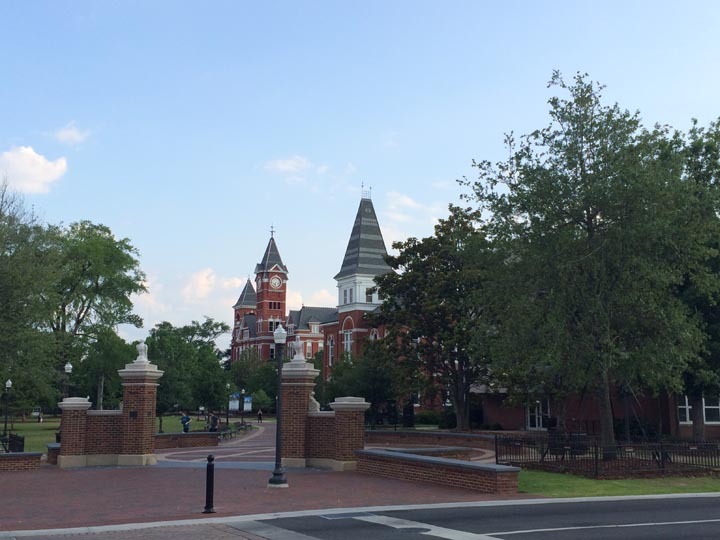 They mark the history of Auburn and the place where town and gown meet at Toomer’s Corner. Also there, the old Auburn Bank (which was until recently a series of bars and is now a pizza joint). That is the gate onto campus, donated by the class of 1917. The eagles had previously perched atop the Penn Mutual Life Insurance Building in Philadelphia and then in a yard there for some years. They arrived in Auburn in 1961 where they stayed until being removed for renovation in 2011. The ones you see here are actually re-casted replications of the originals, which have been removed. The transition is, thus, complete. Everything feels like a gift shop now. You can see all about the downtown markers here. Check out my entire run of the county’s historic markers here. This entry was posted on Thursday, May 19th, 2016 at 9:57 pm	and is filed under Auburn, history, markers. You can follow any comments to this entry through the RSS 2.0 feed. Both comments and pings are currently closed.